IT’S A CRISP FALL DAY AS I RELAX IN THE SADDLE HIGH ATOP A MONTANA RIDGELINE, GAZING out at a spectacular vista of layered mountain ranges that stretch as far as the eye can see. Somewhere south over the horizon, just 65 miles away, is Yellowstone National Park. And somewhere in those ranges runs the Yellowstone River, the longest stretch of untamed river in the lower 48 states. The Lewis and Clark expedition camped along that water, not far from where I sit astride my horse. Trappers and prospectors followed and, later, the wagon trains. Legend says one of those parties was wiped out in an Indian attack, with a lone woman the soles survivor. Her mournful wailing could be heard long after the battle, and the Crow Indians named the mountain range in which she took refuge “the Mountains Where the Crazy Woman Lives.” Today, they’re called the Crazy Mountains. The view I’m enjoying of those peaks from this wonderful vantage point on a dude ranch known as the 63 Ranch probably looks no different than it would have the day those wagon wheels rolled by so many years ago. I’m learning all this from 63 wrangler Bob Yohe, a very knowledgeable, capable and pleasant guide who’s leading me and a half dozen other guests on this morning ride through rolling grassland hills that crest in natural lookout points, offering great views of this unspoiled country. As we turn our backs on the scene of that haunting story and head back to the 63 headquarters for lunch, we’re really not leaving history behind. Because as you enter the gates of this very special place, it’s as if you’re stepping back into the Old West. The story of this dude ranch goes back almost as far as that attack on the wagon train. Start with the name itself. The 63 Ranch uses the same brand George Bruffey created to commemorate his arrival here in 1863, in what was then known as Dakota Territory. It was 1929 when Paul Christensen, his brother, Elmer, and their sister, Jo, bought the land that became the 63 Ranch from Bruffey’s son. The Christensens cut trees from their own property and built the main lodge for the dude ranch they’d envisioned, a building now on the National Register of Historic Places. The first paying guests arrived in 1930. And the 63 has been owned by the same family ever since, offering an historic horseback refuge from the modern world. Today Paul’s daughter, Sandra Cahill, owns and operates the 63 with her husband, Bud, and their son, Jeff. The AQHA life members’ 2,500-acre spread sits at 5,600 feet in the shadow of spectacular Elephanthead Mountain, in a place they call the prettiest country in the West. That’s hard to argue. Step over the border of the ranch property and you’re in the Gallatin National Forest and the Absaroka Beartooth Wilderness. 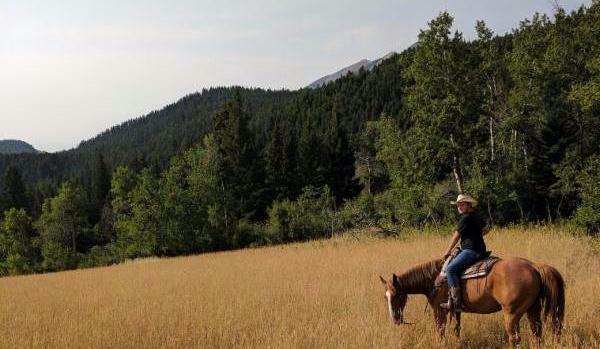 That gives the 63 and its guests horseback access to a million pristine acres of the American West. And there are all kinds of riding terrain, everything from wide-open Montana rangeland to rugged mountain trails to forested paths beside mountain streams, including a trail that leads to a waterfall. Helen McKinney is here with husband David for the fifth year in a row, and the ride back to that waterfall is a favorite. This week in early September is Helen’s third week at the 63 this season. Just as special as the scenery are the horses that take you to see it. Few people know good horses as well as Nancy Smith. She’s an international- level dressage competitor. She and her friend Maryanne Milleman have been vacationing in the western saddles of the 63 for the past eight years. These aren’t the kind of weary dude horses you might rent for a one-hour trail ride. I’m no dressage competitor, but I’ve had some good training on a number of horses. And “Skipper,” my horse, is responsive, sensitive and energetic, as fine a horse as I’ve ever ridden. Whether you’re a top-notch competitor or a 6-year-old stepping into the saddle for the very first time, with 70 horses for their maximum 30 guests, the 63 has the horse for you. And the ranch is picky about which ones are added to the string. The ranch’s dude string includes Goldie Toms Bar, Gee Gee Lady, Hancocks Rebel Music, Free River Luck and Hancocks Triple Jet. Jeff Cahill takes some extra time that first Monday morning to provide guests with more instruction than you might expect. The horsemanship lesson begins from the horse’s point of view. We learn that, like deer, equines are prey animals, wired to run at the first sign of danger. Jeff shows us how a horse likes to be approached, how to behave around his hind feet, how to avoid problems before they happen and, most of all, how to enjoy a week on the back of a sensitive, responsive, well-trained animal. The inexperienced rider was happy to get the lesson. “This is the best instruction and reminder that I’ve ever gotten anywhere,” she says. It gives you an extra comfort level, says my wife, Marilyn. While horses are the focus of this ranch, not everyone comes here to ride. This part ofMontana is famous for trout fishing, and world-class trout stream Mission Creek runs right through the ranch. Other blue-ribbon streams are nearby. Instructor Dean Davis came by one evening to provide equipment and lessons for anyone who wanted to learn. There’s even a trout fishing museum in nearby Livingston, a historic town with plenty ofWestern-flavored attractions. Livingston and the interstate that runs through it might be just 12 miles away, but they’re a world away from the 63, a ranch that feels much more remote than it really is. While a phone is available in the lodge, there are no phones or televisions in the quaint, rustic cabins. No computer unless you bring one. Just beautiful scenery. Peace and quiet. Brilliant stars. Awe-inspiring mountain peaks. Mule deer and wild turkeys, maybe even a moose or a black bear.We loved escaping the real world for a week. Savoring every precious moment, we chose to never leave the ranch during our entire stay. And since this is a working ranch, chances are you’ll have opportunities to enjoy a real taste of the cowboy life. We helped drive a herd of cattle into a new pasture, searched for strays with Jeff and lent a hand as the wranglers worked cattle in the corral and the cowboys vaccinated the animals. Whether you spend your day riding, fishing, painting, taking a day tour of Yellowstone or just relaxing with a book, you’ll share your day’s adventures over delicious, hearty family-style meals in the main lodge. You’d have to stay here three weeks before the very tantalizing menu repeats. Bud and Sandra help serve. Guests who were strangers to one another quickly become friends. And as the week wears on, you may feel more like family than a guest. Music is often a highlight of the evening. One night, it’s square dancing; the next, it’s two-stepping to Livingston’s humble Pretty Good String Band, whose talents far exeed the name; or an informal concert by the award-winning Western music duo Open Range. “You’re coming out here, you’re getting that Old West (experience),” says singer Ric Steinke of a visit to the 63. “It’s kinda like going back in time, coming out here,” adds his Open Range partner, Linda Hausler. If you want a spa, a plasma television or the latest video game, this is not your cup of tea. But if you want to experience an authentic, western dude ranch, this is it. There are often tears when it’s time to go, even among the grownups. Historically, Montana is a dude ranch paradise: The 63 Ranch in Livingston is the first dude ranch in Montana to be declared a National Historic Site. Founded in 1863, the ranch boasts more than 100 miles of trails within minutes of its corral and has been owned by the same family since 1929. Horses outnumber guests here two to one. Guests as young as four learn to ride around the corral, while experienced riders can join cowboys in moving or gathering cattle and throwing lassos and ropes. Depending on ability, children as young as six can go trail riding. Located 50 miles north of Yellowstone National Park and adjoining the two million-acre Gallatin National Forest, the 63 sits at an altitude of 5,600 feet. With comfortable log cabins and varied menus that accommodate low cholesterol, high fiber, vegetarian and other diets, the 63 serves grass-fed beef from its own herd, homemade baked goods and other artisanal fare. The dining room never serves alcohol but allows guests to bring their own libations onto the property. Last week, while city folk toiled in their grim cubicles, I was in Montana. On horseback. Driving cattle. Yippie ki-yay . The place was the historic 63 Ranch, a vast spread of pastures and pine trees and mountain meadows, nestled up against the Absaroka Mountain Range, just north of Yellowstone Park. Beyond the forested Absarokas looms the jagged, sawtooth ridge of the Crazy Mountains, with nearly vertical peaks reaching almost two miles high from the Yellowstone River valley. To try to go over them, you would have to be crazy. The 63 Ranch is a family operation, staked out in 1863. Since 1929, it has been a dude ranch, but always with a big herd of beef cattle, too. The cattle have to be moved to new pastures from time to time and us dudes sometimes are allowed to help. The legitimate wranglers could manage without us, I suspect. My horse was Shiloh, a bouncy and responsive sorrel gelding, splashed with white. What really distinguished Shiloh, however, were his eyes. They were two different colours, one brown, one icy blue. He sometimes gazed back at me over his shoulder with that icy blue eye. I think he was admiring my hat.